The state of Colorado implements a Graduated Drivers Licensing (GDL) program that increasingly grants driving privileges to minor drivers as they become more knowledgeable and gain more experience behind the wheel. You cannot drive alone. A parent, legal guardian, driving instructor, or a licensed adult at least 21 years old must be with you in the front seat at all times. Seat belts are mandatory for all teen drivers and their passengers. Seat belt sharing is prohibited. Cellphone use is not allowed. 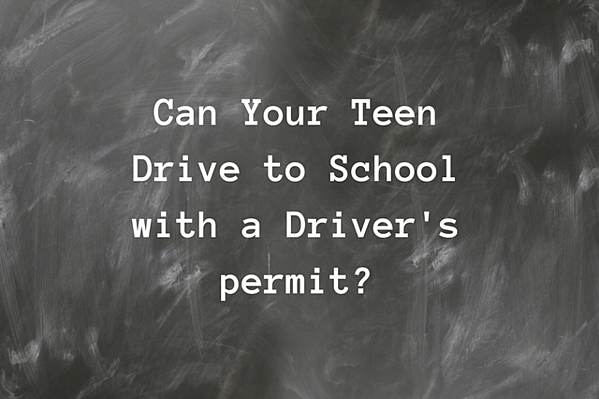 Now, we go back to the question: If you are under 18, can you drive to school with a driver’s permit? Yes, if you are accompanied by a parent or guardian, driving instructor, or an authorized licensed adult aged 21 and older. Otherwise, no, you cannot. The same rule applies to driving to work. Unless with the presence of an adult in the front seat, there is simply no way you can drive your way to work. The bottom line, therefore, is this: A driver’s permit allows you to drive only if your parent or legal guardian, a driving instructor, or a licensed adult is with you in the front seat, buckled up. Don't fret, however. The moment you obtain a driver’s license, you can start driving to and from school or work unsupervised. So take advantage of the provisions of your driving permit and the presence of a licensed, knowledgeable adult to gain as much driving knowledge and experience. If you are a teen driver in Colorado, the driver’s permit is your first step towards obtaining a full, unrestricted driving license. Upon issuance of your driving permit, you can start logging the practice driving hours required to apply for a driver’s license - a total 50 hours, 10 of which for driving at night. If you are under 18, you must practice driving with a driving instructor, parent, legal guardian, or any authorized licensed adult aged 21 and above. If you are younger than 16 ½, an additional six hours behind-the-wheel training with an instructor from an accredited driving institution must also be logged. This requirement, however, does not apply to teen drivers living in areas where no driving schools exist within 30 miles. As a substitute, you can log an additional 12 hours of supervised training on your timesheet. Driving to school on their own is one of those things most teenagers want to be able to do. While a driving permit restricts you from driving alone, it is your ticket to obtaining a driver’s license, which will ultimately allow you the freedom to drive alone, provided you follow all applicable rules and regulations. If your teenager needs help with their driving permit, Western Slope Driving Institute can help. Our team of instructors includes former law enforcers and first responders. Call us today for any questions you may have.